THE ANNUAL DEER SLAUGHTER is underway. I don’t mean the guns of autumn. I’m talking about the carnage on our rural roads. This is a highly active season for deer as they come down off the mountains in the evenings to graze and to seek out their watering areas. Deer aren’t the smartest animals, and they have a habit of darting out onto the road in front of cars and trucks during darker hours, and they often don’t make it. The unfortunate animal flies several dozen yards through the air. Almost always, it suffers a broken leg or internal injuries. It might struggle off into the bush to die in agony, or fall by the side of the road and suffer the same fate. I once found one in my yard and buried it. Burying a dead deer isn’t easy. People drive too damn fast during these evenings, and they don’t pay attention. One farmer near where I live tells me he used to see a hundred deer in his hay fields on a daily basis. Now, there might be a dozen. Several have been killed near his house in just the past couple of weeks. He’s tried to get something done about it, but other than the 60 kmh zone being extended past his house, nothing has happened. Aside from the suffering caused to the deer, the dollar cost must be tremendous. Every vehicle that goes into a body shop for repairs represents a bill of several thousand dollars. 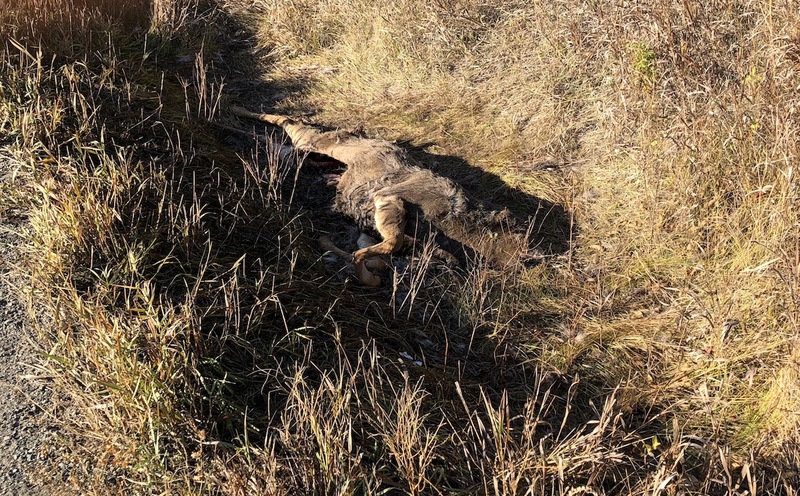 While some carcasses are ignored and left for raven and coyote food, most have to be picked up and hauled away. We pay for that. We kill about 10,000 animals a year with our autos in B.C., so why don’t we do something? Why don’t we drive slower, and why don’t ICBC and the Ministry of Transportation put more signs and maybe some portable warning lights in high deer-traffic zones, and do more on public education? It would save some deer, and save us all some money. Why don’t we drive slower, even on residential road full of young families and dogs? And the worse offenders are some of the neighbors! And they get mad at you just for waiving your hand at them to slow down. A neighbourhood speed of 30km/h should be implemented on all residential streets, despite Todd Stone and his supporters objections. Speeding is like graffitis…anther form of “I don’t care attitude” so pervasive nowadays. We, are building and building and fencing, along the main waterway of this whole valley. Has anybody thought about how difficult it is for these animals to drink? We are driving them into certain areas, that they have no choice, but to travel through and it puts them into a fleeing situation to get to the water and to get away.